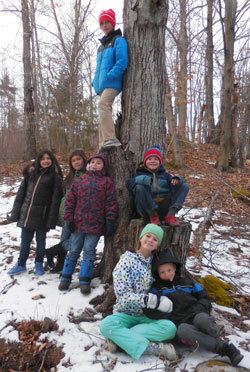 Students get out and bond with nature in the new CCC KIDS club. 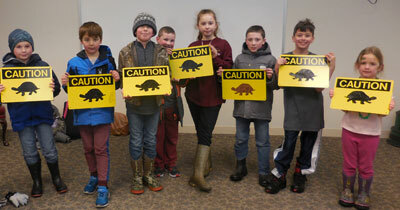 Children in the CCC KIDS club helped Mrs. Lindsey paint the "Critter Crossing" signs that will be put along Candia's roads this spring to help protect crossing animals. These signs will be displayed and available at Candia's Town-wide Roadside cleanup on Sat., April 27th at Moore Park as well. In addition, residents can contact the Conservation Commission to get one to place on their road. 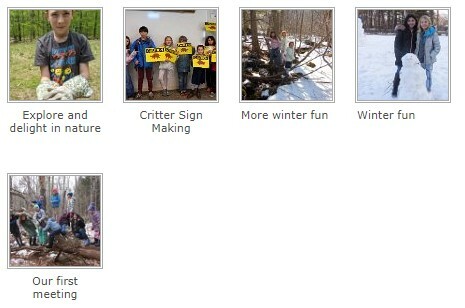 Our photo gallery was updated on March 29, 2019 with new CCC KIDS Club photos! 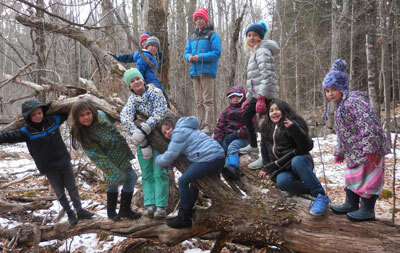 Mrs. Lindsey's new Candia Conservation Commission KIDS Club - the "CCC KIDS Club" - met for the first time on Monday, January 7, 2019 at the Smyth Library. The purpose of this club is to give students an opportunity to get out and bond with nature! It is the first step in helping children connect with their natural environment and natural resources so that when they become citizens in their communities, they will know the importance of protecting the woods, streams, ponds, and wetlands that they have walked through and loved. For more information, contact the Conservation Commission at info@candiaconservationcommission.org, attn: Judi Lindsey. ©2019 Candia Conservation Commission. All Rights Reserved.